Whit Deschner squanders most of his time in eastern Oregon where he is run by a small ranch, writes, and runs the annual Great Salt Lick benefit/contest/auction with proceeds going to Parkinson’s disease research. Pianist/composer Keith Taylor specializes in ragtime music for silent movies. His numerous CD’s and DVD’s are available through CD Baby, Nostalgia Family Videos. 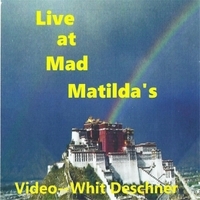 For this video DVD, Whit Deschner has collaborated with pianist/composer Keith Taylor, using the music from Taylor’s CD Live at Mad Matilda’s, to create a photographic montage of images to accompany the music. All proceeds from this artistic endeavor will be donated to Parkinson’s disease research.